Municipality urges residents to use the Light Rail for transport Monday and Tuesday, as many roads will be closed. 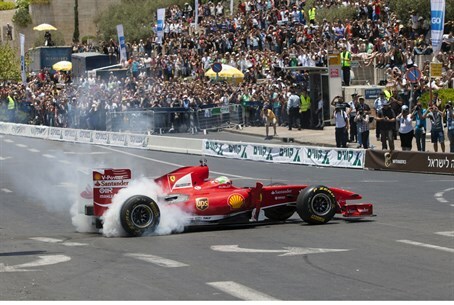 Jerusalem's second annual Formula One race is set to start at 3:10 p.m. Monday, with the top-of-the-line racing cars setting off from the Old Train Station compound for a 20-minute spin around the city, following which the race will begin. The race will last three hours, and the drivers will include famous names like Giancarlo Fisichella, as well as four young Israeli drivers, headed by Roy Nissany. The same schedule will be repeated Tuesday. Following the race, an exhibit of racing cars will take place at the Old Train Station compound. Many of the city's streets will be closed to traffic because of the event. The following streets will be closed from noon until 9 p.m.: Yitzchak Kariv, King David from Agron to David Remez Junction, David Remez, Hevron Road from Miriam Hahashmonait southward, Hativat Yerushalayim, Tzahal Tunnel in both directions, Agron from Paris Square to Meches Square, Keren Hayesod from Shalom Aleichem to Flumer Square, Jabotinsky from Flumer Square to Yitzchak Elchanan, Bethlehem Road from Emek Refaim to David Remez, Heil Hahandasa from Zaks Junction southward, Hatzanchanim Road. Cars that park in these streets will be towed to the Old Train Station compound. Residents of the Jewish Quarter and Yemin Moshe will be permitted to enter only upon producing an ID card, and only from specific entrances: Wadi Joz, Derech Yericho, Derech Haofel, Har Tzion Parking Lot and the entrance to Mishkenot Shaananaim. The Begin Highway will be open in both directions, and there will be shuttles to the race from Teddy Stadium. The Haleom Parking Lot will also be open free of charge and shuttles will operate from there, too. Due to the traffic changes, the Jerusalem Municipality advised residents not to use their cars for travel on Monday and Tuesday and to choose the Light Rail instead.